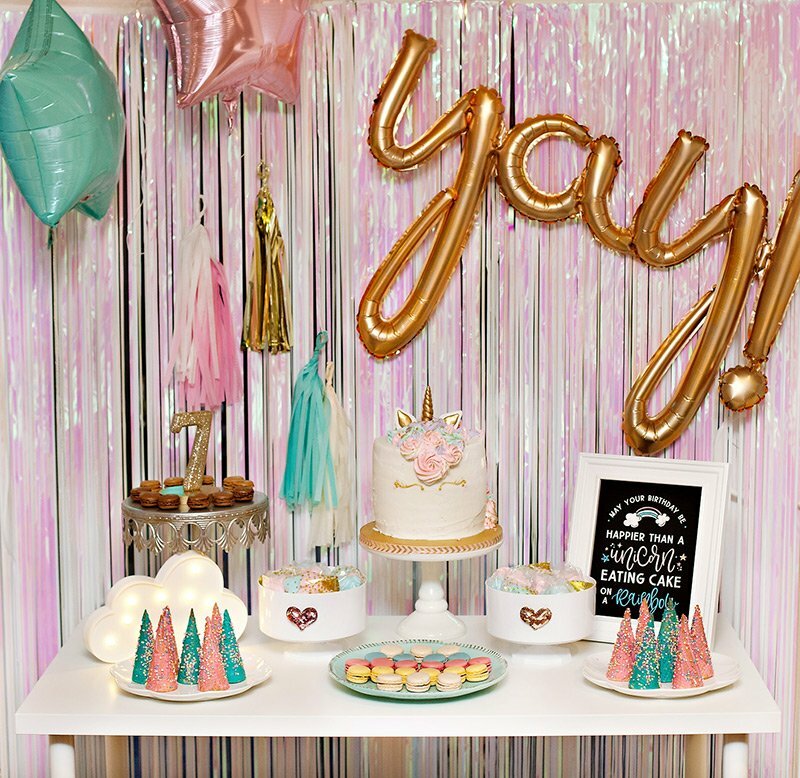 While super-duper cute, just like every party that Kate Landers does, the inspiration behind this particular party that she created in honor of her sweet baby (4-month old Noah) is very outside the norm… and it addresses a serious subject in a very creative, therapuetic way. 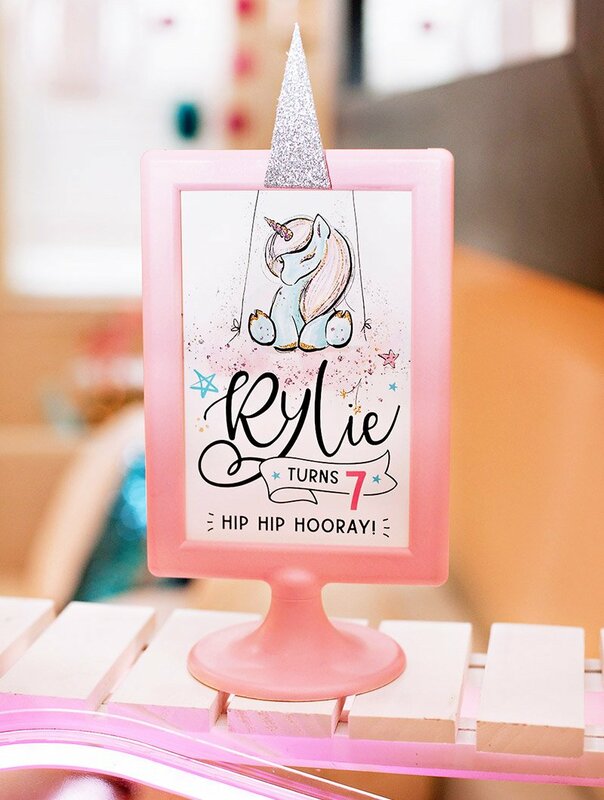 This “Tortilly Adorable” may look like it’s just another children’s party, but it’s actually more for the adults! I kept thinking, “Does our sweet baby really have to suffer through wearing a medical helmet 23 hours a day, for 4 solid months?” GUILT was the first feeling that filled our hearts, wishing we could have done something to prevent this. Soon after was a flood of tears, I never thought I was going to stop crying. I only wished I could wear the helmet in his place. 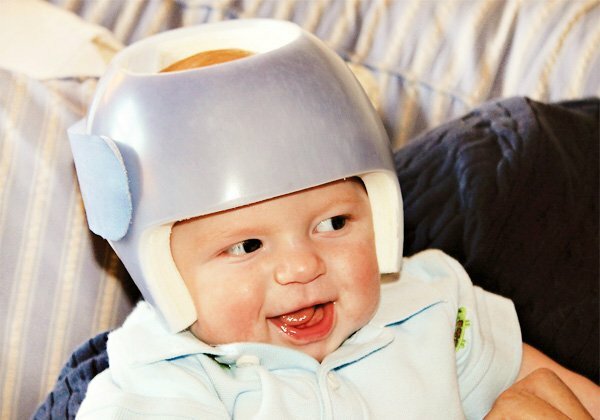 As I hopped online to learn more about plagiocephaly and torticollis, I found some comfort in the fact that it is not all that uncommon these days, and best of all, the helmet treatment, in addition to physical therapy for the torticollis, often provides outstanding results to prevent permanent deformities of the head and face. If caught early enough, as in our case, we have excellent chances of great success for Noah. It was from my research for support groups and tips from other moms online who have had a child with a helmet, that I discovered so many parents feeling tremendous guilt as I had. I wanted to do something creative to help parents cope (personal coping mechanism in the works here as well, of course)–as it is said the babies adapt very easily to their helmets–it’s often harder on the parents/caregivers. Therefore, I decided to throw a party! This party was not only to debut his helmet to our immediate family, but also to educate them on his condition, share the physical therapy exercises they can do when taking care of Noah, and provide creative answers to give people should they ask about Noah and his helmet. Planning this party was great therapy for me, and I hope planning a helmet party might be therapeutic for others as well (especially as there are other medical conditions that offer helmet therapy)! I wanted to do something cute, sweet, and appropriate for a baby. My husband Ryan and I immediately thought of turtle shells when we saw the helmet, and decided on a turtle theme. Torticollis sounded like tortoise, and we rolled it into “tortilly”, and since Noah and other babies we saw with helmets at Children’s Hospital were so darn adorable in their helmets, we thought we’d call it a “Tortilly Adorable” party. With the party being for adults, we knew it wasn’t about what to serve baby, but what to serve our guests. 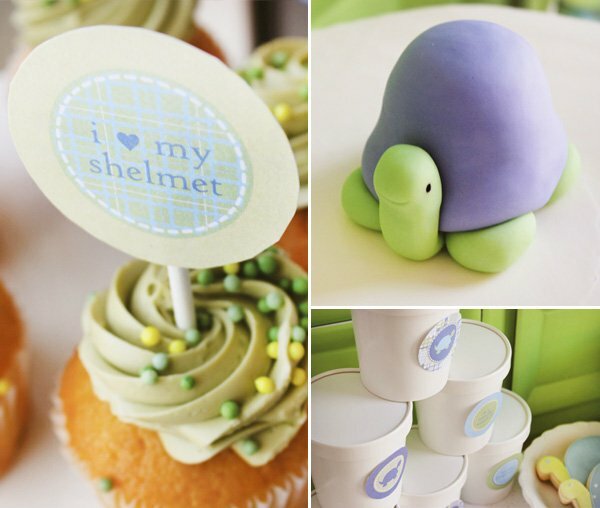 So we opted for a cake (adorned with a darling fondant turtle), cupcakes decorated with the printable cupcake toppers, and cookies (both madras with fondant baby turtle toppers as well as turtle shaped cookies). Everyone was able to eat a slice of cake, and take home some cookies to enjoy later–very simple. I went with a very small sofa table so I wouldn’t go overboard adding too many sweets. I saw the brilliant idea of a paper plate backdrop by Piggy Bank Parties, and decided to go that route, making it a double-layer of plates to look like the details on the back of a turtle shell. The backdrop was inexpensive, festive, and reinforced the color-scheme and theme with great texture, too! 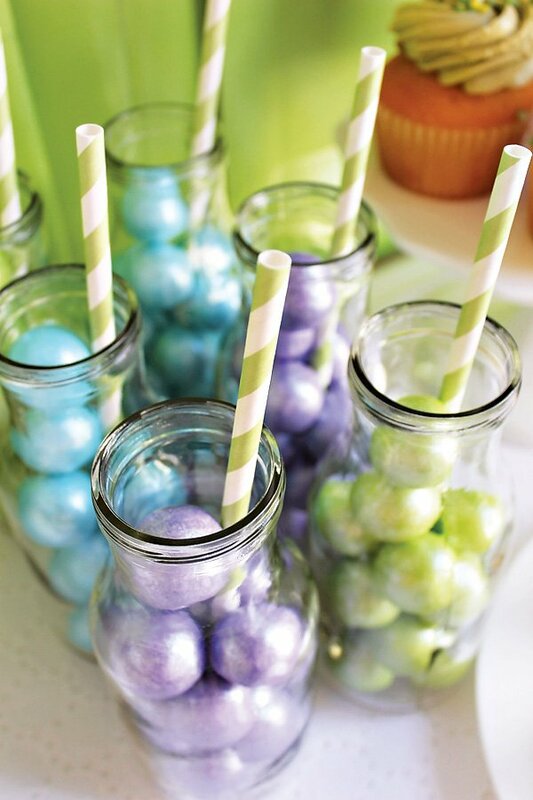 I used white platters and cake stands to match the table, and just HAD to throw in some candy…so we filled darling glass milk bottles with gorgeous shimmery gumballs and those infamous striped paper straws –it added pops of color, and I have to say everyone LOVED the gumballs and took them home to enjoy later. Little did we know that Noah’s helmet was going to be a periwinkle color–we ordered light blue and expected it as such–we in fact LOVE the color he got, and I couldn’t resist placing it on the dessert table (since it wasn’t officially worn yet) to get a great photo. 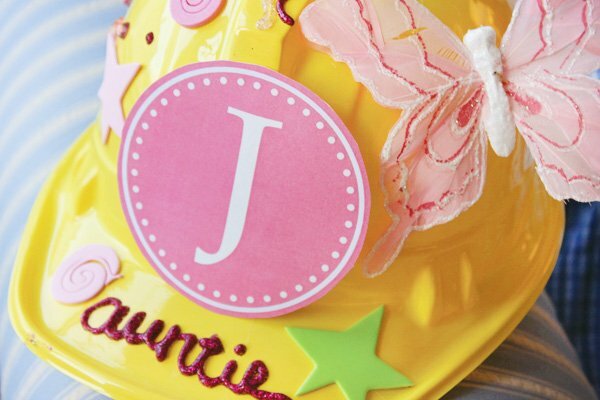 We also stacked the white favor cartons on the table, which were full of adorable printable stickers, glitter glue, faux flowers and other goodies to decorate helmets with. Everyone said they wished they could wear a helmet in Noah’s place…so we went with that, and had everyone wear and decorate helmets they brought/we provided at the party! It was a lot of fun to see everyone enjoying themselves in the process! We set up a table with glue guns, grosgrain ribbons, foam cut outs and more, so people could pick and choose how to decorate their helmets. We look forward to Noah’s 2 week appointment this week, where we will bring in a set of printables and the downloadable free helmet stickers designed & donated by so many fabulous designers, hoping that they may offer them to other families going in and finding out their child needs a helmet, too. Noah is doing great, and I think a celebration will be in order to commemorate when the treatment is done! 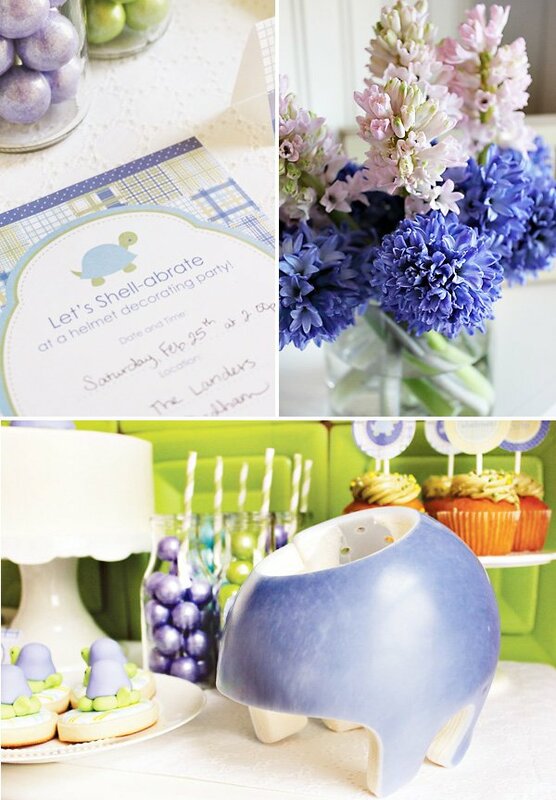 Such a wonderfully sweet party to educate others and celebrate Noah! Absolutely love the theme/idea. My second was so close to wearing a helmet when she was that age. When she started walking (surrounded by tile and glass tables at my mom’s house) I almost wished she had one. Congrats on your beautiful little boy! Of course, it’s a great party, Kate. I love that you are spotlighting this. One of my twins had left torticollis and I also felt like a terrible mom — I hadn’t even noticed that she tilted until our pediatrician pointed it out. After being evaluated for a helmet, several months of therapy, and “homework,” we were over the hump. You will be too! Take care and congratulations on your precious Noah! 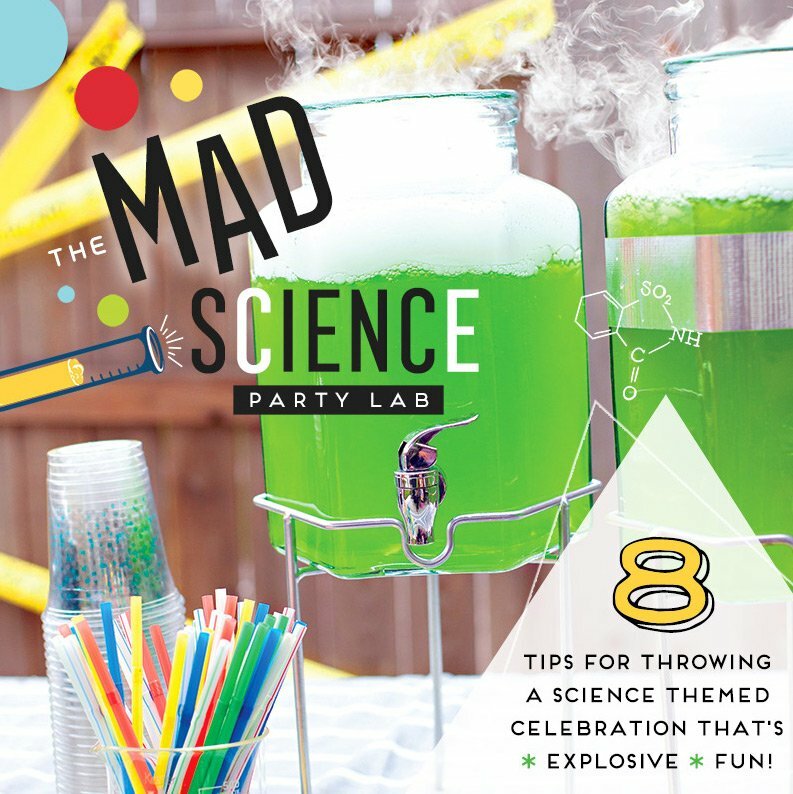 What a wonderful, creative and heartwarming idea for a party. I think that is a great idea to introduce the family and friends to what the condition is and to provide them with above all some important information but to add a bit of whimsy to the situation. Bravo and what a beautiful boy you have! He has one creative and caring Mother. All the best to you all. oh i could just eat him UP! 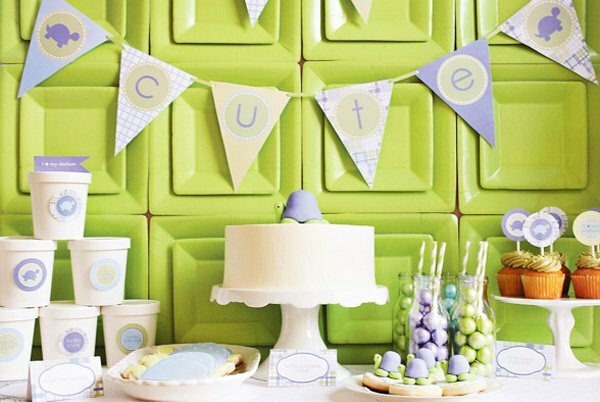 sweet, sweet party idea, sweet, sweet decor and a sweet, sweet family to turn a negative into a positive and help others in the process. i adore every. single. thing. about this! kudos! What an incredible party. And, what an amazing way to educate the folks in Noah’s life (not to mention those of us reading online)! How thoughtful to share the printables and the party ideas with other parents going through the same challenge. I am so touched by this story. I will definitely say a prayer for Noah and his family. This is a heart warming story and I admire the way you turned a time of sadness into something educational and loving…and you did it so cute!!!! Many blessings to your baby!!!! I love your party idea. My oldest son had to wear a helmet. His doctor also told me that he would have speech and dental problems. I was so devastated and blamed myself. He is now 10 years old with a beautiful head! When he speaks, you can not tell that he had speech therapy for 5 years. Thank you for sharing your post. Your son is beautiful! Kate, I have always admired you and your work and now I am an EVEN BIGGER FAN!!! Kudos to you for using your talent to inspire and help so many people. I just linked to your super cute idea on my blog about my family’s journey with plagiocephaly. 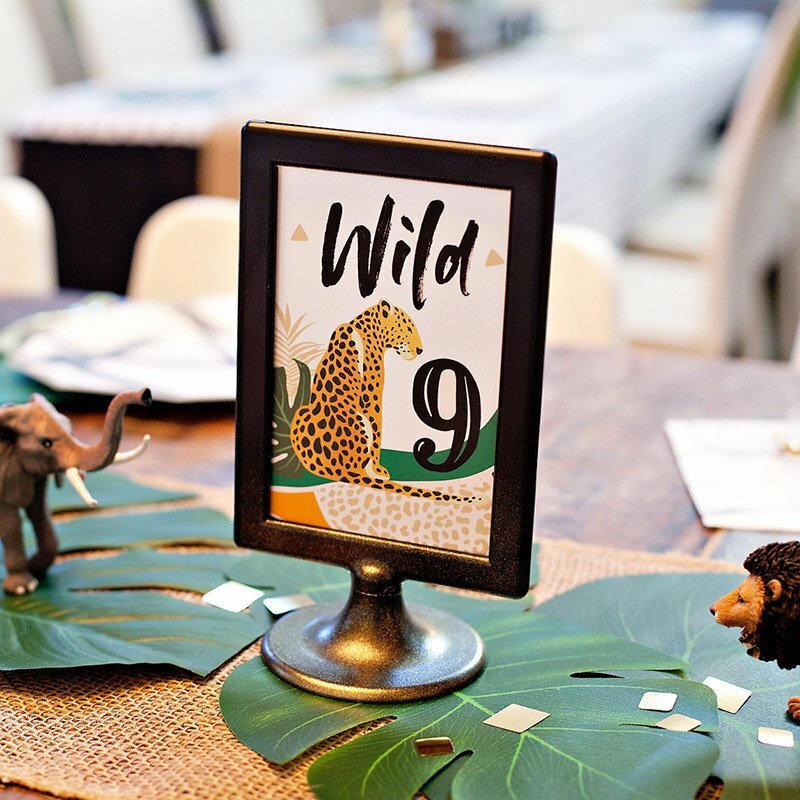 You have feeling similar to many other moms in this situation, and I just love this party idea. If we hadn’t already had a child with a helmet, maybe I would have considered this!! Now it is just old news for us. 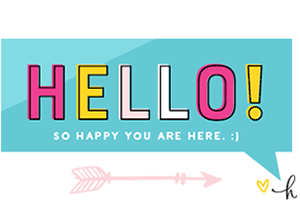 Thanks for posting about your situation! Wow Kate, what a fantastic and strong heart you have.! You will definately help others wihile you are healing yourself. Your little guy is so beautiful & my prayers are with all of you. Great party too! This is great!! Such an awesome idea. Our now 17 month old daughter, Ainsley, was diagnosed with Brachycephaly and Plagiocephaly (her head is slightly larger on one side & looking down, her head looks triangular. Thankfully her case was very, very mild and did not require a helmet. We were told that she was the “after” of most kids with her condition. We too felt so blessed as we waited at the Children’s Hospital in Chicago as we were meeting with a neurosurgeon to rule out a skull reshaping surgery. It is such a joy to see other parents raising awareness of such a common condition. These beautiful little babies are perfect in every way & it’s a blessing to see a celebration of this instead of just brushing it under the rug. What a sweet idea! One of the hardest things with so many medical diagnoses is that very few people are really informed on them. 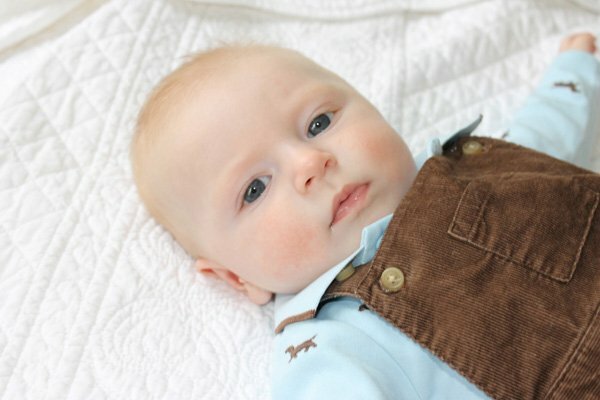 This party is a great way to help people learn about this adorable baby’s condition. 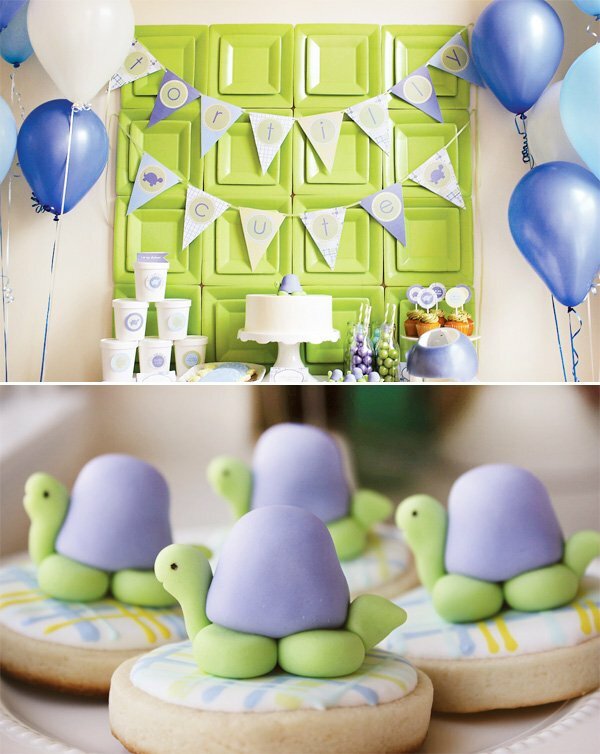 And the turtle theme is just adorable! This is the cutest idea! My little guy had to wear a helmet as well, and I love that you embraced the helmet with your theme. We decorated my son’s helmet with an SF Giants theme (http://www.mommybeta.com/blogs/2010/12/13/how-to-decorate-a-plagiocephaly-helmet.html) and he had a Giants birthday party as well ! You threw a gorgeous party! 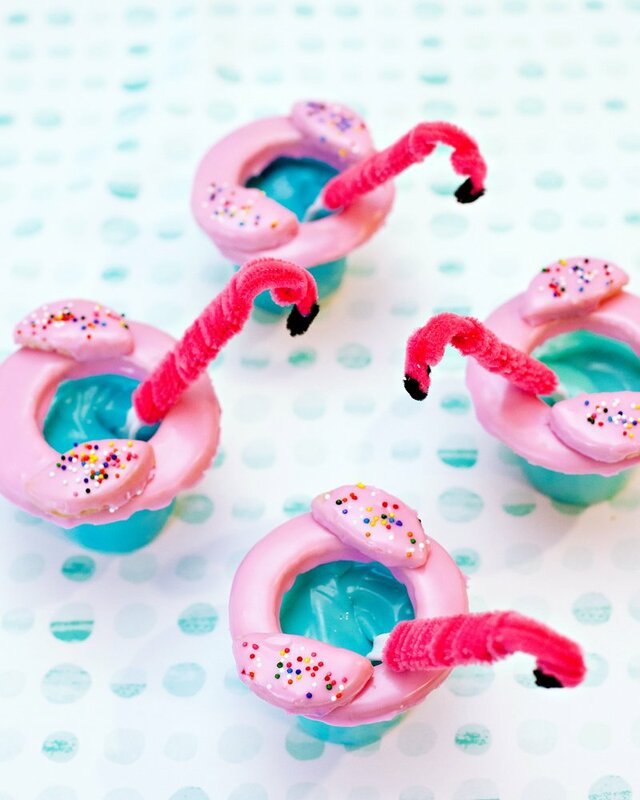 Cute..Cute Party!! My daughter was diagnosed with severe plagiocephaly as an infant. She spent 6 months in a helmet The closest clinic to us was 6 hours each way but we made that drive every other week and so happy we did. She will be 6 this summer and every day I brush her hair and think how blessed we are that her head rounded out. Where we are from there are very few babies who wear bands/helmets- it was my pushing to even get her diagnosed and treated because the dr’s here were not very familiar with it. Thanks for bringing awareness to this issue!